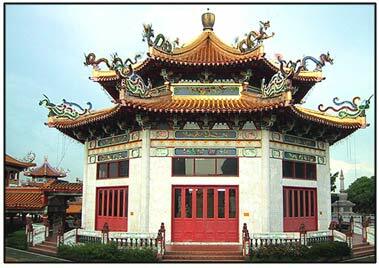 The Chinese Buddhist monastery or temple is fashioned after the imperial palaces and bears very little resemblance to the temples in India or other Buddhist countries. Generally there are three groups of buildings separated by courtyards. The monastery, like other Chinese structures, normally faces south. Entering the front hall, one is confronted by four huge images, usually made from wood, two on each side. These are the Four Heavenly Kings or Devas, the Guardians of the Four Directions and the hall is named after them as the 'Si-Tien Wang Tien'. In this hall, one is greeted at the entrance, by the lovable and kindly Buddha-to-be, Maitreya Buddha, known to the Chinese as the 'Laughing Buddha' or 'Ta-pao Mi-Lei-Fwo, with his fat paunch, looking joyously towards the entrance. Directly behind Mi-Lei-Fwo, often separated by a wall, is the great deva Wei-to, the Projector of Buddhist temples and the Faith. He is depicted clad in full armour and holding either a gnarled staff or a sceptre-shaped weapon resting on the ground. Wei-To, who is a general under the Four Heavenly Kings, is also accorded the title of 'Protector of Buddhist Books'. He is always facing the Great Hall known as the 'Ta-Hung-Pau-Tien' which is separated from the front hall by a wall or a courtyard. In the Great Hall the main altar is found and on it is the image of Sakyamuni Buddha and his twoforemost disciples, Mahakasyapa and Ananda, or other Buddhas of the past eras. The arrangment and choice of personages in this altar varies from temple to temple. Most of the time Sakyamuni Buddha is depicted in an attitude of comtemplation with his disciples flanking him. Temples dedicated to Amitabha Buddha have his image at the centre, Sakyamuni Buddha and Bahaisajyagura, better known to the Chinese as 'Yao-Shih-Fwo', are each accompanied by two disciples. To the right and left of the main altar one usually finds the two Great Bodhisattvas, Manjusri (Wen-Shu-Shih-Li) and Samantabhadra (Pu-Hsien). The placement of personage are not really fixed so that one may often find Sakyamuni Buddha being flanked by Amitabha (O-Mi-Two-Fwo) and Yao-Shin-Fwo (Medicine Buddha), the two great Buddhas of past eras. At other times a single Buddha is seen seated between his two Bodhisattvas, Sakyamuni (Shih-Jia-Mo-Ni-Fwo) between Manjusri and Samantabhadra or Amitabha Buddha with Avalokitesvara (Kuan Yin) and Mahasthamaprata (Ta-Shih-Chih). Temples dedicated to Kuan Shih Yin P'usa will have her flanked by Wen-shu-Shih-Li and P'u-Hsien. On the east and west walls of this Great Hall are often arranged the figures of the Eighteen Arhats (Lohas) who are represented as possessing various kinds of supernatural powers. Along the north wall can be found the images of Jan-teng Fwo or Dipankara, the ancient Buddha who predicted Sakyamuni's Buddhahood, and popular Bodhisattvas such as Kun Yin, Wen-shu, Pu-Hsien and Ti-stsang (Ksi-tigarbha), or other Bodhisattvas. Very often, an image of Kuan Ti, the Protector of Buddhism, can also be found in this hall. It is here at the Ta-Hung-Pau-Tien that devout Buddhist offer their prayers and offerings of flowers, fruits and other gifts which are placed on the table in front of the main altar. 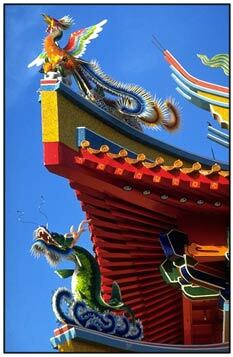 Very often, behind the central images of this hall and facing northwards, is placed the images of Kuan-Yin P'usa. The third, of Back Hall, is usually divided into several smaller halls (Tien) or rooms. The central hall is generally the altar of a Buddha or a Bodhisattva, the right housing the funerary tablet of the temple founder, while the left may be the Teaching or Meditation Hall. On the side or behind these main buildings are the living quarters, the dining area and the kitchen.